CLEVELAND, Ohio – Before Dark Shadows came along, the vampire's job description was fairly limited. If you were a vampire, you were a predator – a relentless killing machine without a soul and without any hope of romance, reclamation or redemption. You were locked in that box. You might exhibit the occasional seductive and sympathetic quality, to be sure, but there was no escaping your fate, which typically meant a heartfelt encounter with a wooden stake or a bad case of sun exposure. All of that changed in the most unlikeliest of places: a daytime soap opera. Dark Shadows, which is celebrating its 50th anniversary, forever transformed the vampire story with the introduction of Barnabas Collins, played by Shakespearean actor Jonathan Frid. Barnabas was the first vampire to question his own nature and successfully fight it. He was the first to have a fully-loaded conscience, complete with heavy doses of angst, recrimination and regret. He was the first to ask, "Do I have to live like this? Can I change?" He was the first to reclaim his heart and soul. After that, anything was possible for the vampire character. The incredibly influential Barnabas blasted away the limitations, creating a storytelling path for the increasingly humanized, romanticized and sensualized vampires found in Anne Rice's Interview With the Vampire and its many sequels, the post-Dark Shadows Dracula films starring Frank Langella and Gary Oldman, Buffy the Vampire Slayer and Angel, Underworld and Twilight, True Blood and The Vampire Diaries. Not only could the vampire be human, he or she could be more heroic. None of this would have happened if Barnabas hadn’t brought new blood to the vampire. But when Dark Shadows premiered on June 27, 1966, there was no vampire on this ABC soap. In fact, there wasn't even anything supernatural about it. The brainchild of producer Dan Curtis, who would go on to direct the epic World War II miniseries The Winds of War and War and Remembrance, it was a Gothic soap opera set in the small Maine fishing village of Collinsport. With fans and stars of the show gathering in Tarrytown, New York, for the 50th anniversary Dark Shadows Festival, what follows is something of an oral history drawn from about 50 interviews with key players both before and behind those ABC cameras. The interviews were conducted over the last 25 years. Some of those interviewed multiple times, including Frid and Curtis, are no longer with us. Others, including David Selby, Kathryn Leigh Scott, Lara Parker, John Karlen, Jerry Lacy, Nancy Barrett and Marie Wallace, continue to meet with fans. Begin with the idea that Dark Shadows started as a Gothic drama and, after several months, it was heading for the graveyard of cancellation. Dan Curtis: "There was supernatural in it. When it was going down the tubes, my kids said to make it scary. I said, 'Why not? I've got nothing to lose.' So I put a ghost on and when the ghost appeared, the ratings jumped. And that's when I started experimenting." Director Lela Swift reminded Curtis that they were crossing the line by adding a supernatural element to the show, but, emboldened by the ratings blip, the producer added first a phoenix, then a vampire. "Barnabas was brought in because I wanted to see exactly how much I could get away with, never intending that he would be anything more than a vampire that I would drive a stake into. I wanted to see how far I could go on the show into the supernatural, and I figured there was nothing more bizarre than a vampire." But Frid, the actor given a three-month contract to play Barnabas, had never played a vampire, and no one could tell him how to go about playing one. So he went to work on building the character. Jonathan Frid: "I know I had a good approach to the character. I tried to make him a perfectly sensible person. I never played a vampire. I played him as a man with a lot of conflict. But I could never perfect what I wanted to do, and that stiffness just fed Barnabas because he was so uptight." Curtis envisioned Barnabas as a monster in the tradition of Bela Lugosi's Dracula. There was one little problem. Frid, a classically-trained actor, didn't go along with this thinking. Frid: "I remember being invited to a meeting on the Saturday at the studio to talk over the character. Asked for my opinion, I said to make him human – remember he's real and every monster is a human, of sorts. The behavior is something else. But it all began to develop over a couple of weeks." The fans picked up on this and soon, the vampire was on his way to becoming the most popular character on the show. Curtis: "Who knew? I brought the vampire in, and it suddenly became this gigantic hit. Then I thought, 'Now what I am going to do?' I couldn't kill him off, so that's when I turned him into the reluctant vampire. It really caught the imagination of the audience." 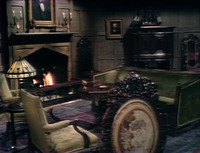 Dark Shadows became a full-fledged pop-culture phenomenon, and emboldened by the success of Barnabas, Curtis and the writing team started introducing all sorts of supernatural storylines "inspired" by such classic works as Frankenstein, The Picture of Dorian Gray, The Turn of the Screw and Dr. Jekyll and Mr. Hyde. Kathryn Leigh Scott, who played Maggie Evans and is the co-author of Dark Shadows: Return to Collinwood: "One reason Dark Shadows has lasted as long as it has is it began as a classic. We drew on world literature, so it was almost an anthology series." But the one great innovation was the development of the deeply conflicted vampire character battling his predatory nature. Scott: "Without question, without the character of Barnabas Collins, you wouldn't have the vampires of today. The romantic and sympathetic vampire is absolutely iconic and that all started with Barnabas and Dark Shadows." Given this, the show and the actor don't tend to get the credit they deserve. Jim Pierson, longtime assistant to Curtis, author and director of the annual Dark Shadows festivals: "Everything about vampires was in the dark, literally, before Jonathan. The essence of Jonathan Frid was this guy who wanted to act. He didn't want to play a singular note. He just did his own thing, and his character came across as sympathetic." Among the most popular characters on the show was the wily witch Angelique, played by Lara Parker, who has penned Dark Shadows novels. Lara Parker: "When I go back and look at episodes, I'm flabbergasted by the screenwriting craft. There's not a scene without an amazing amount of conflict. Everyone there was a theater actor, so the level of commitment to these scenes was total. We responded to the writin, and the viewers responded to our performances. As a very young actor, I took a lot of it for granted. I didn't realize we were making something for the ages." One of the two main writers, Sam Hall, had never written anything in the horror genre. Married to series regular Grayson Hall, he was recruited by Curtis to work on the show. Grayson Hall: "Any television show is a bizarre education, but that's particularly true when you work with Dan Curtis. All Dan Curtis productions have fog inside the houses. I never understood how it got there." Rarely stopping for retakes, Dark Shadows aired 1,225 half-hour episodes from June 27, 1966, to April 2, 1971. Jerry Lacy, who played lawyer Tony Peterson and two different Reverend Trasks: "Taping soaps in those days was akin to being live, because it was difficult and expensive to edit. So you only stopped for a real disaster. That's why so many goofs got on the air." Those goofs have become part of Dark Shadows lore. David Selby, who played Quentin Collins: "You talk about learning on your feet. You taped an episode once through, and if you made a mistake, you just kept going. We shot live on tape and almost never stopped. Dan would say, 'Don't worry about it. No one will ever see it again.'" Under such pressure, it helped that a great camaraderie developed among the cast. Scott: "We'd meet for drinks after the show. Thayer David called us a repertory company, and that's exactly what we were. We all enjoyed working with each other." It was an experience that greatly helped the young actors in future endeavors. John Karlen, who played Willie Loomis: "You had to be a good team player. I think that notion of being a good player helped me on Cagney and Lacey " (where he won an Emmy for his portrayal of Harvey Lacey). The stressful conditions also fueled their performances. Parker: "That's why it had a spontaneous feel to it. Sometimes we had to tape without even a dress rehearsal. It had an edge to it. I can remember actually stopping only two times in five years. It was easy to deal with the fear, because we believed it would go out once and never be seen again." The series ignited a merchandising boom and spawned two feature films, but, by 1971, the ratings were down and it was canceled. Selby: "It was a meteor. It burned incredibly bright, but it couldn't be sustained." But the fans refused to let the show die. It has been endlessly repeated and all of the episodes are available through MPI Home Video. Frid: "It is totally the fans, no question. It was the fans from the very beginning. Acting is a shared experience between the actor and the audience. Each brings something and when the audience participates, catches on, something happens. The actor relies on the audience." Those fans gathering in Tarrytown continue to give the show life. Selby: "I think another reason we're still talking about Dark Shadows is the characters. It created a world that doesn't age. It was extremely ambitious for its time, but the sets were all crammed into a little New York studio and the special effects were elementary by today's standards. Still, despite all of that, or maybe because of that, it has a charm that has endured. Like the characters, Dark Shadows has a kind of immortality, and, for an actor that's a precious gift." Source: Mark Dawidziak, The Plain Dealer, June 25, 2016.